3. 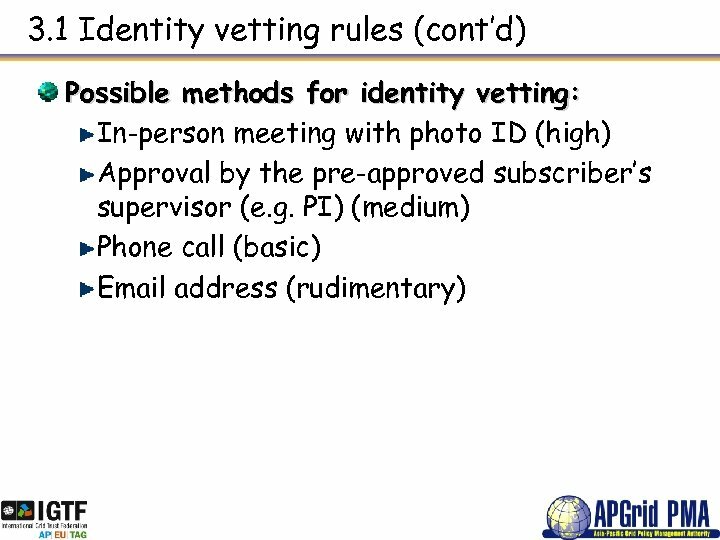 1 Identity vetting rules A CA must define the role of registration authority (RA) which is responsible for the identity vetting of all end-entities. 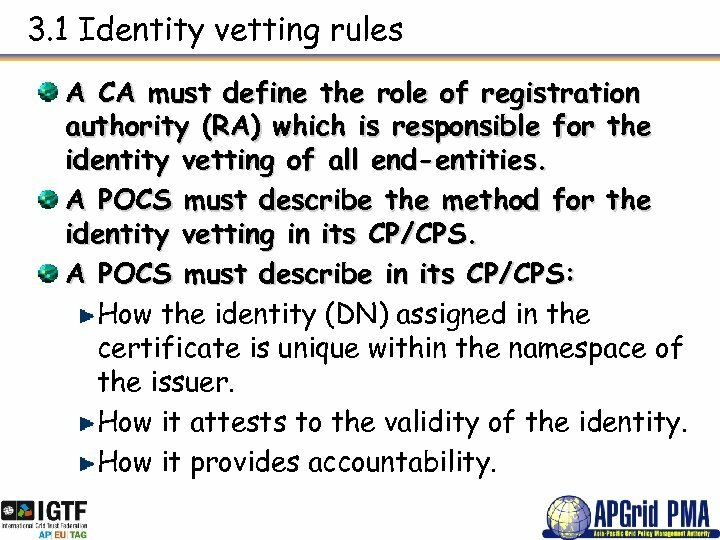 A POCS must describe the method for the identity vetting in its CP/CPS. 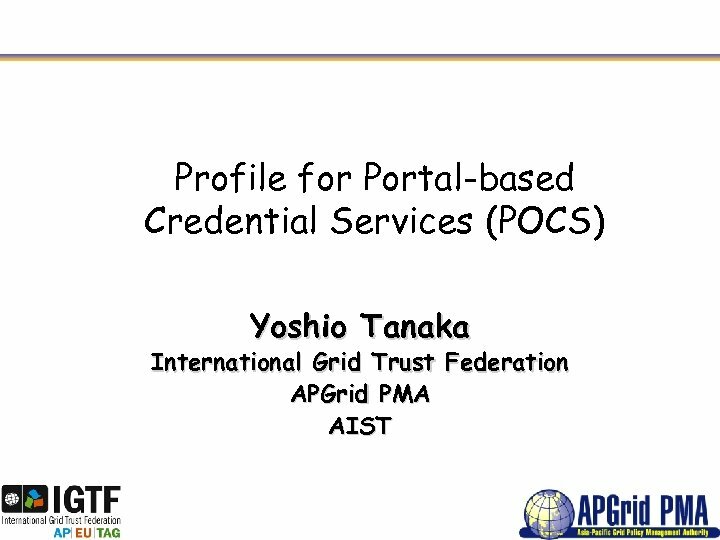 A POCS must describe in its CP/CPS: How the identity (DN) assigned in the certificate is unique within the namespace of the issuer. How it attests to the validity of the identity. How it provides accountability. 3. 2 End-entity certificate expiration, renewal and re-keying Certificates (and private keys) managed in a software based token should only be rekeyed, not renewed. 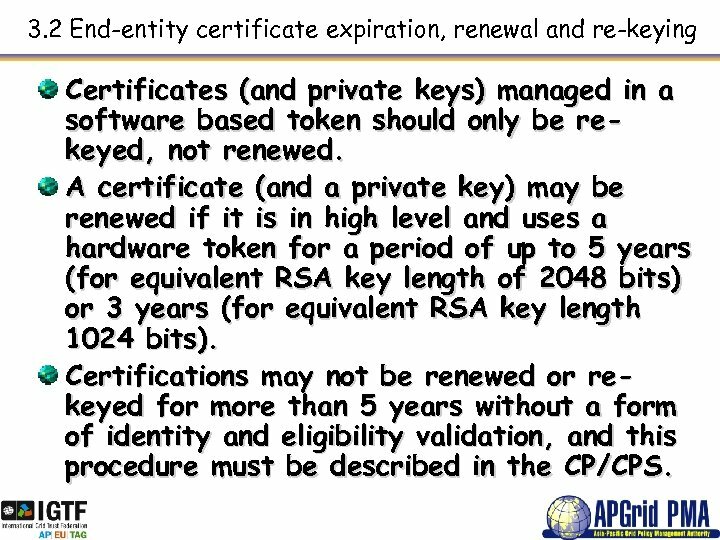 A certificate (and a private key) may be renewed if it is in high level and uses a hardware token for a period of up to 5 years (for equivalent RSA key length of 2048 bits) or 3 years (for equivalent RSA key length 1024 bits). Certifications may not be renewed or rekeyed for more than 5 years without a form of identity and eligibility validation, and this procedure must be described in the CP/CPS. 3. 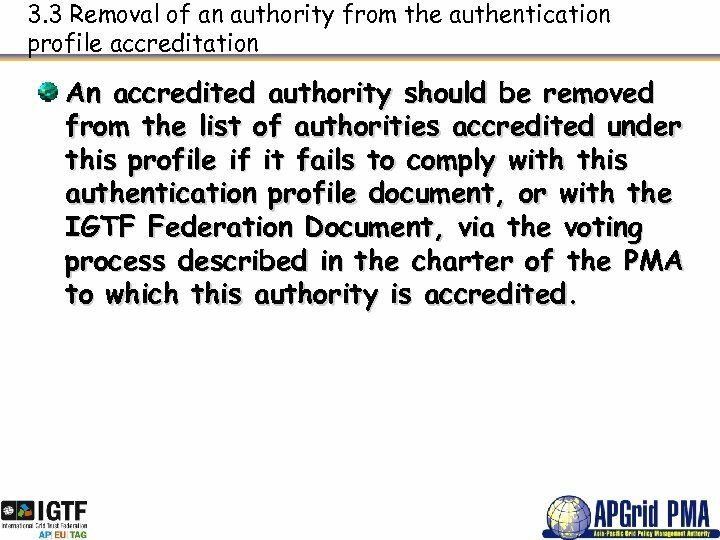 3 Removal of an authority from the authentication profile accreditation An accredited authority should be removed from the list of authorities accredited under this profile if it fails to comply with this authentication profile document, or with the IGTF Federation Document, via the voting process described in the charter of the PMA to which this authority is accredited. 4. 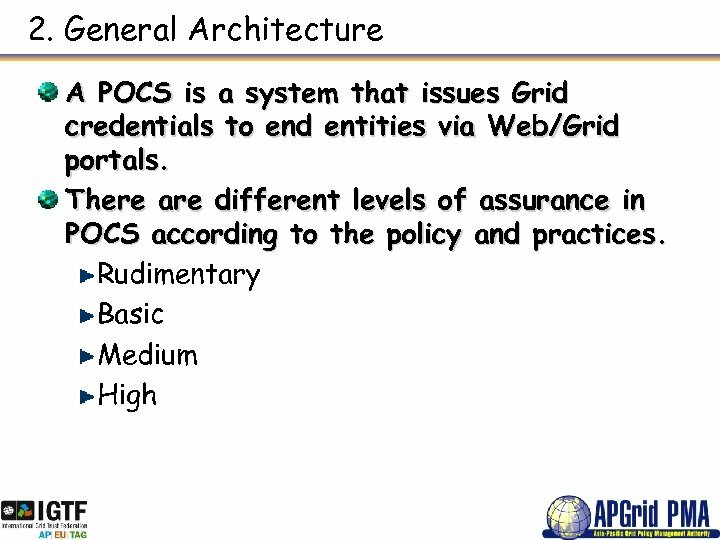 1 Certificate Policy and Practices Statement Identification Every POCS CA must have a Certificate Policy and Certificate Practices Statement (CP/CPS Document) and assign it a globally unique object identifier (OID). 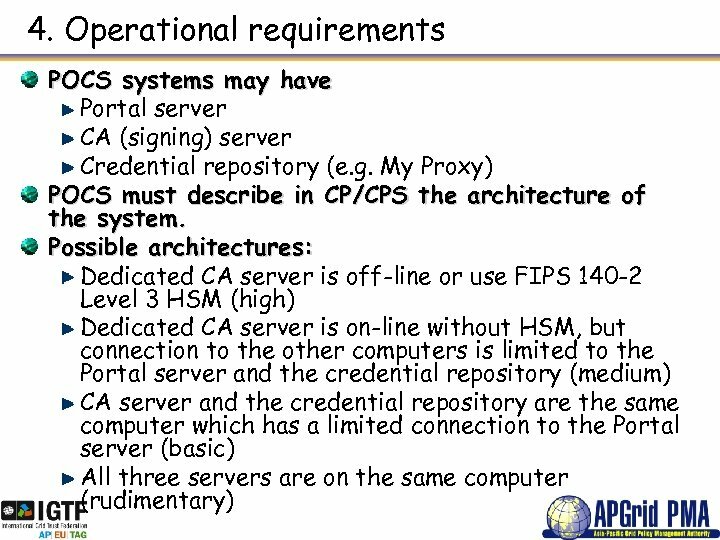 CP/CPS should be structured as defined in RFC 3647. 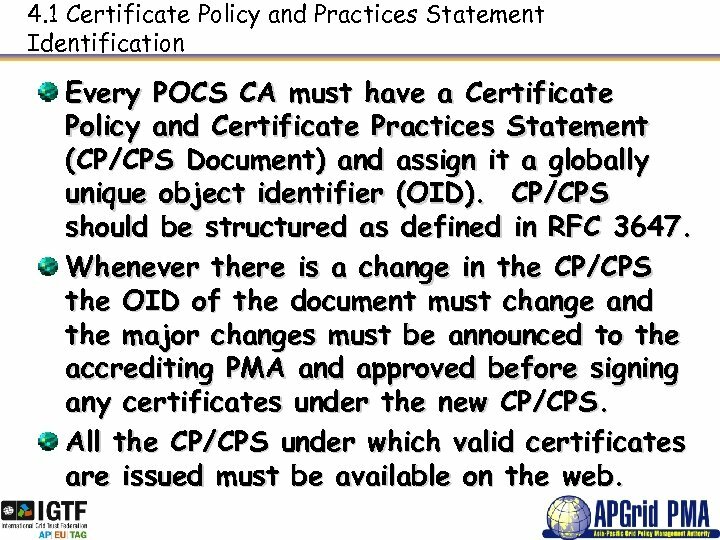 Whenever there is a change in the CP/CPS the OID of the document must change and the major changes must be announced to the accrediting PMA and approved before signing any certificates under the new CP/CPS. 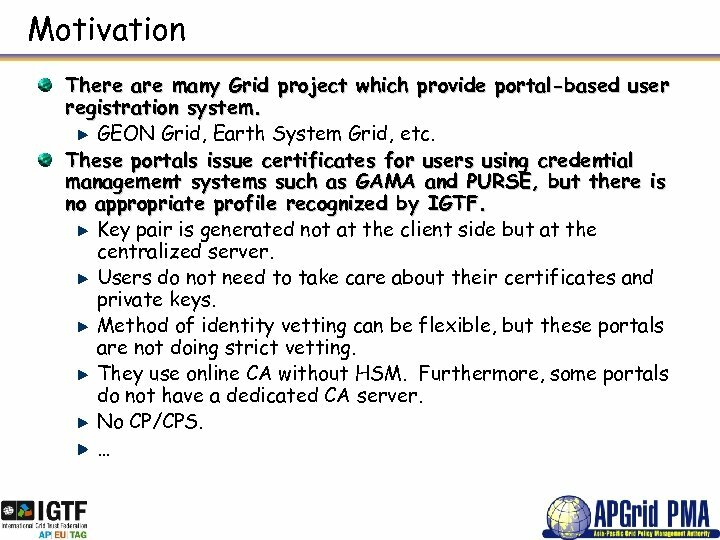 All the CP/CPS under which valid certificates are issued must be available on the web. 4. 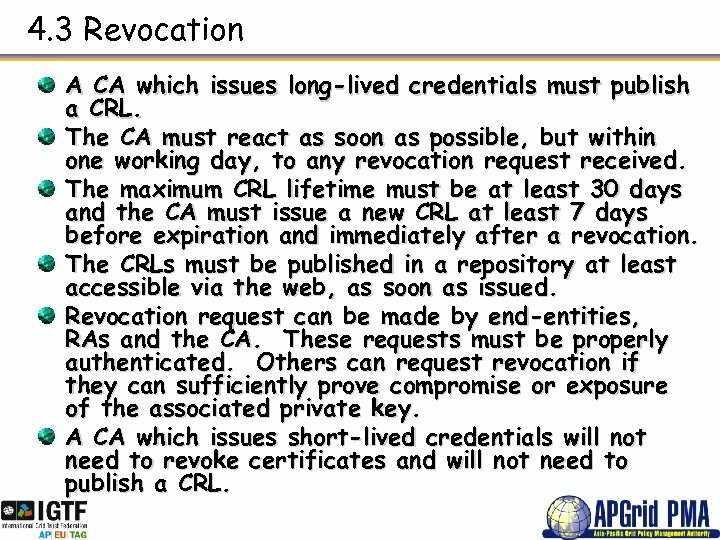 3 Revocation A CA which issues long-lived credentials must publish a CRL. The CA must react as soon as possible, but within one working day, to any revocation request received. The maximum CRL lifetime must be at least 30 days and the CA must issue a new CRL at least 7 days before expiration and immediately after a revocation. The CRLs must be published in a repository at least accessible via the web, as soon as issued. Revocation request can be made by end-entities, RAs and the CA. These requests must be properly authenticated. Others can request revocation if they can sufficiently prove compromise or exposure of the associated private key. A CA which issues short-lived credentials will not need to revoke certificates and will not need to publish a CRL. 4. 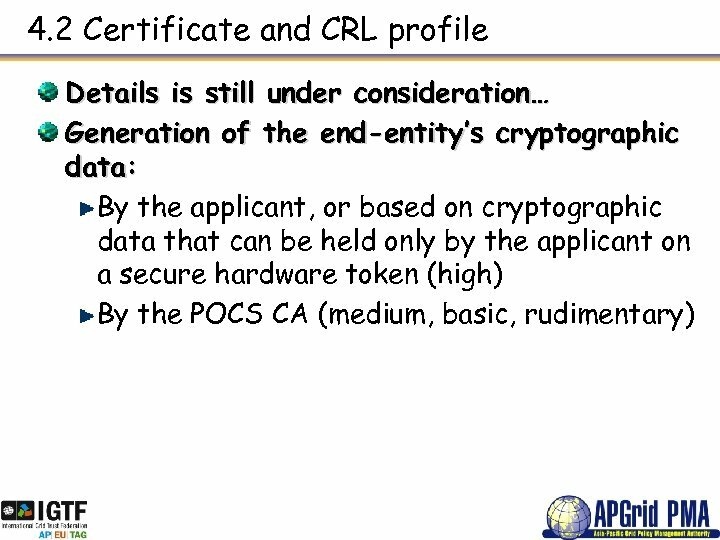 4 CA key changeover When a POCS CA’s cryptographic data needs to be changed, such a transition shall be managed; from the time of distribution of the new cryptographic data, only the new key will be used for certificates signing purposes. 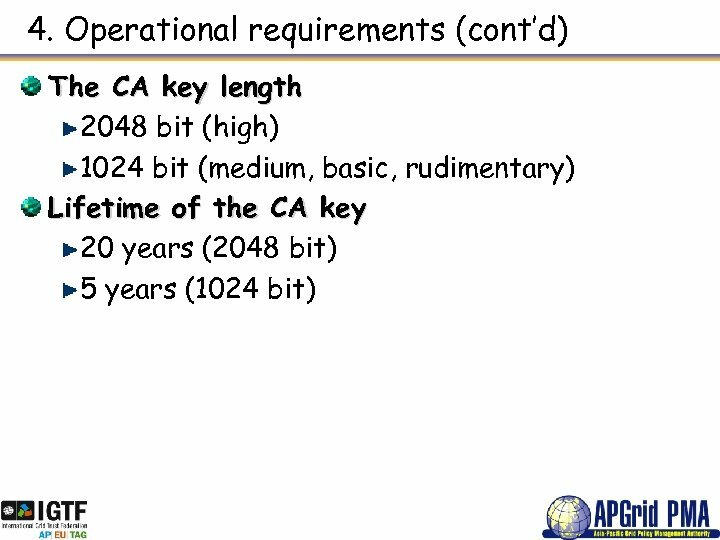 The overlap of the old and new key must be at least as long as the time an issued certificate will be valid. 5. 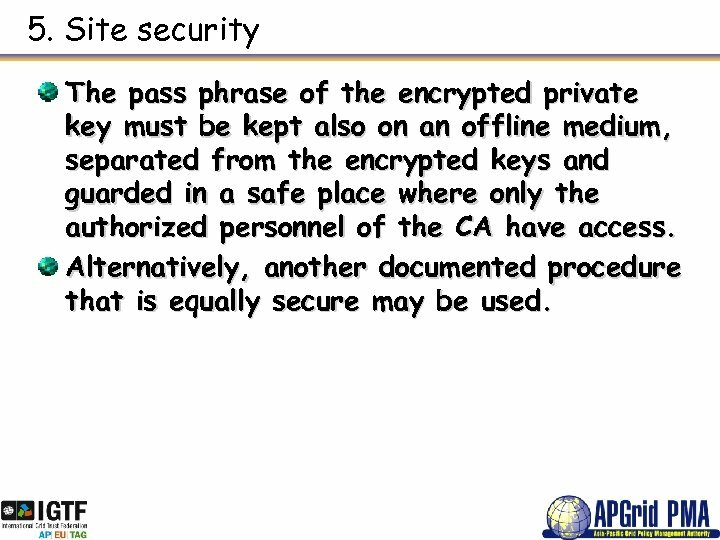 Site security The pass phrase of the encrypted private key must be kept also on an offline medium, separated from the encrypted keys and guarded in a safe place where only the authorized personnel of the CA have access. Alternatively, another documented procedure that is equally secure may be used. 6. 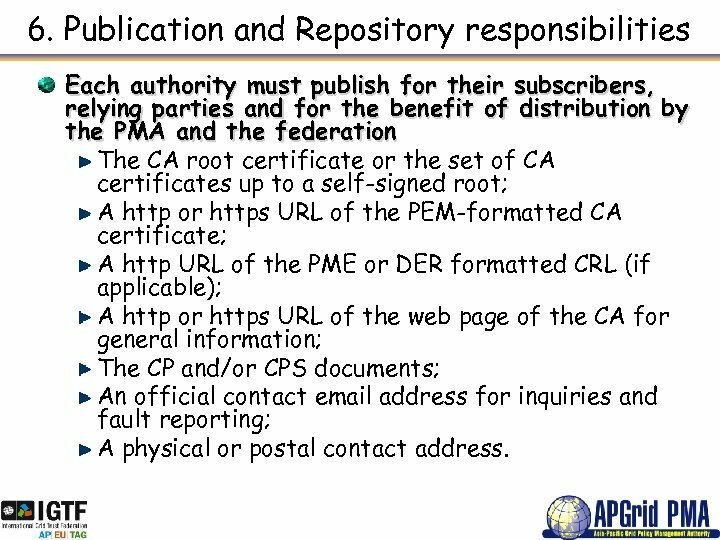 Publication and Repository responsibilities Each authority must publish for their subscribers, relying parties and for the benefit of distribution by the PMA and the federation The CA root certificate or the set of CA certificates up to a self-signed root; A http or https URL of the PEM-formatted CA certificate; A http URL of the PME or DER formatted CRL (if applicable); A http or https URL of the web page of the CA for general information; The CP and/or CPS documents; An official contact email address for inquiries and fault reporting; A physical or postal contact address. 6. Publication and Repository responsibilities (cont’d) The CA should provide a means to validate the integrity of its root of trust. 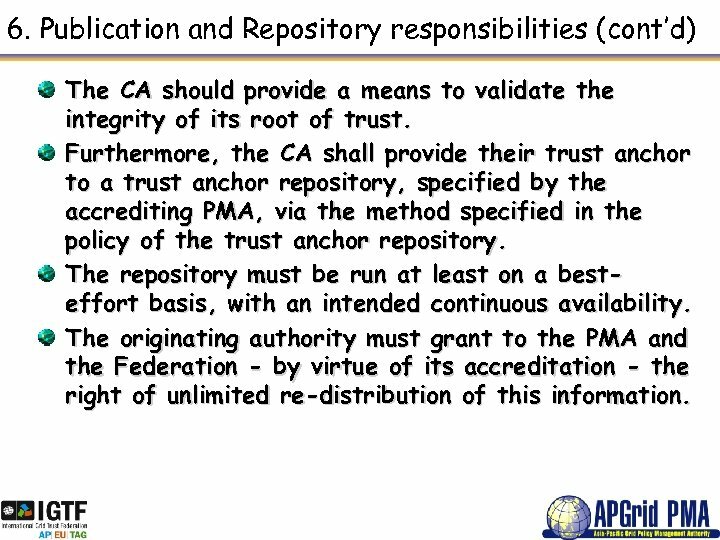 Furthermore, the CA shall provide their trust anchor to a trust anchor repository, specified by the accrediting PMA, via the method specified in the policy of the trust anchor repository. 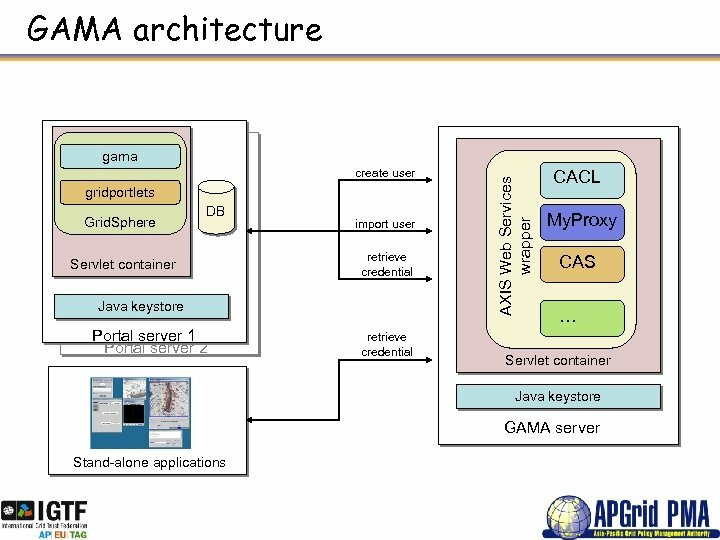 The repository must be run at least on a besteffort basis, with an intended continuous availability. The originating authority must grant to the PMA and the Federation - by virtue of its accreditation - the right of unlimited re-distribution of this information. 7. 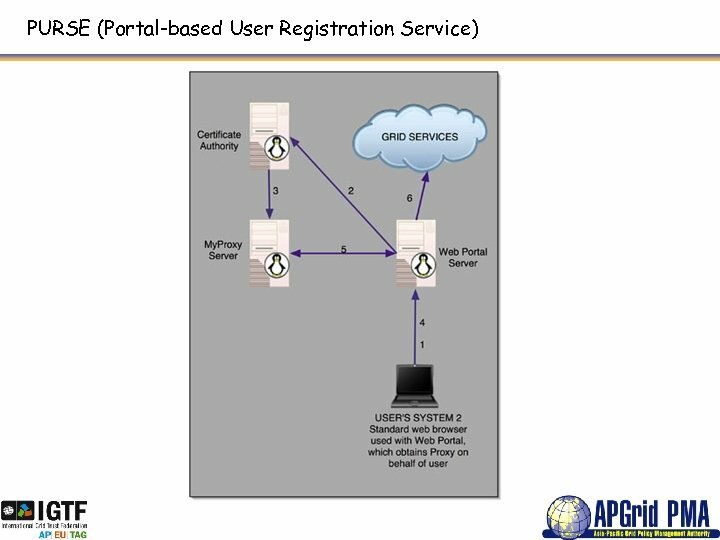 Audits The CA must record and archive all requests for certificates, along with all the issued certificates, all the requests for revocation and the login/logout/reboot of the issuing machine. The CA must keep these records for at least three years. These records must be available to external auditors in the course of their work as auditor. Each CA must accept being audited by other accredited CAs to verify its compliance with the rules and procedures specified in its CP/CPS document. 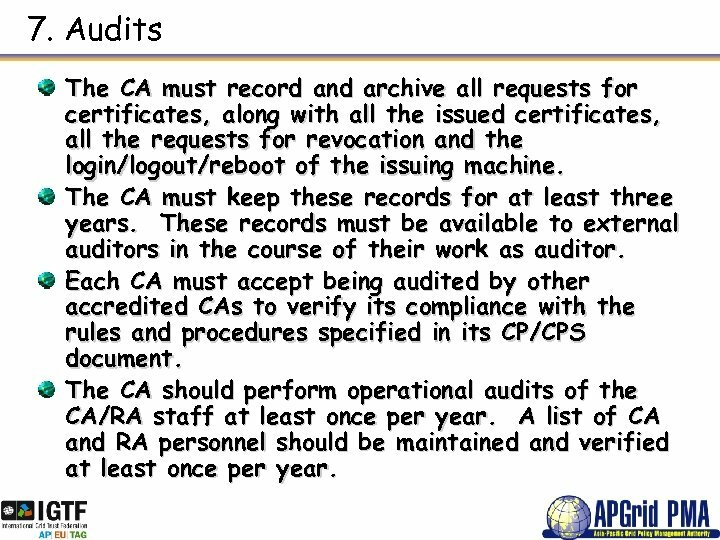 The CA should perform operational audits of the CA/RA staff at least once per year. A list of CA and RA personnel should be maintained and verified at least once per year. 8. 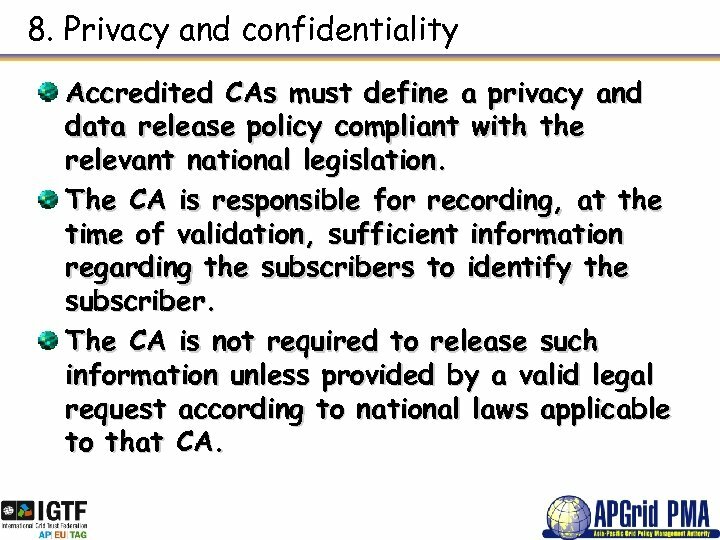 Privacy and confidentiality Accredited CAs must define a privacy and data release policy compliant with the relevant national legislation. The CA is responsible for recording, at the time of validation, sufficient information regarding the subscribers to identify the subscriber. The CA is not required to release such information unless provided by a valid legal request according to national laws applicable to that CA. 9. 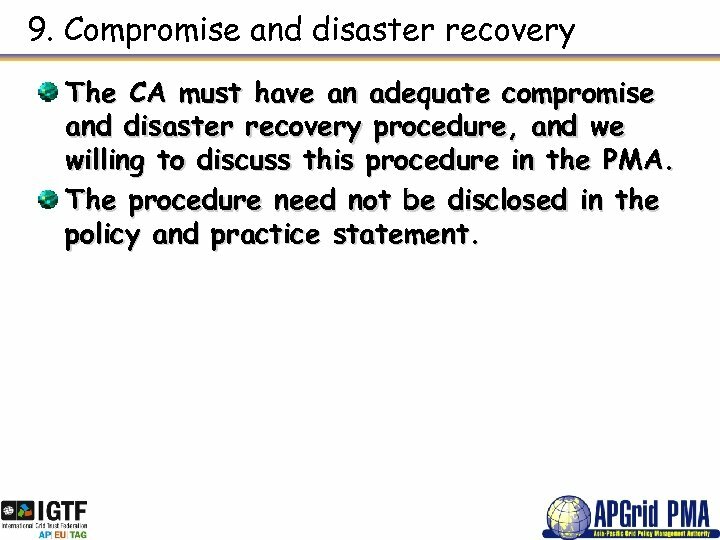 Compromise and disaster recovery The CA must have an adequate compromise and disaster recovery procedure, and we willing to discuss this procedure in the PMA. The procedure need not be disclosed in the policy and practice statement. 9. 1 Due diligence for end-entities The CA should make a reasonable effort to make sure that end-entities realize the importance of properly protecting their private data. ORO Maritime import & export Ltd. Co.